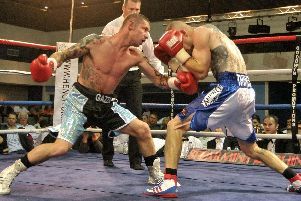 The Leigh Park charge blitzed his way to a TKO victory over Jamie Proctor at BKB 15 on Saturday. The 36-year-old knew a win at London’s Indigo at the O2 would earn him a crack at the heavyweight belt. Parker put that to the back of his mind, though, and stopped Proctor in the second round to move his record to 4-1. 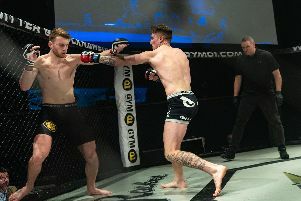 Now the former Staunton Park Community School pupil, who is trained by ex-pro and ABA Champion Billy Bessey, will fight for the silverware at BKB 16 on March 30. Parker’s opponent is set to be announced in the next few days and he is relishing the upcoming battle. He said: ‘The promoters told me who could be next if I won the fight. ‘I went out there, did the job and I was more focused than ever. ‘Now hopefully this big fight is announced very, very soon for the British title. Things are looking very good for me. ‘It was my best performance by far – everyone said that. Now it’s all about the next one. ‘I was confident in training ahead of the fight. I knew as long as I went in focused and kept my guard high then I’d win. Prior to the bout, Parker vowed he was going to drop the Mr Nice Guy attitude that had let him down in his only career defeat to Mason Shaw. After cutting Proctor open in the first round, he continued to press his foot on the gas in the second, causing the referee to intervene. Parker felt his constant pressure earned him his latest success. He added: ‘I think I got hit once in the first round so my movement was fine. ‘I am a pressure fighter and like to get in my opponent’s face. ‘When I try to box too much it doesn’t work for me and it’s been about adapting to bare-knuckle boxing. ‘I have had five fights now and know what to do. ‘You’ve got to get in there and get involved because the fights are only over three rounds. The title fight will be over five rounds so might be a bit different. ‘I just let my hands go in the second round. The lad was struggling to see with blood covering one eye and then got cut again from another eye.